Always Radiant Daily Liners keep you feeling fresh every day! They feature a CleanGuard™ Quilted Core that absorbs wetness and odors to help you stay feeling confident. Plus, their stay in-place design moves with you for amazing comfort. 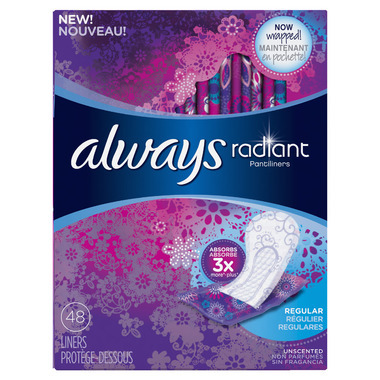 For a clean feeling every day of the month, try Always Radiant Liners. Great for everyday use. Don't even feel them on.